Care for patients with facial differences, specifically cleft lip and palate and other craniofacial anomalies, is routinely provided in North America by interdisciplinary teams of specialists. These teams often consist of 10 or more clinicians who have one ultimate focus—to provide the best possible care for patients and their families. The average treatment schedule for a patient with cleft lip and palate can involve multiple surgeries, including the initial lip and palate repair, bone grafting, myringotomy, and possible jaw and nasal surgery. In addition to these surgeries, the patient is monitored for speech, hearing and dental development, as well as the need for orthodontic treatment. Most treatment is completed by the time a patient is 18 years old, but in some cases care may continue beyond this age, depending on individual needs. Dental care is focused on early infant oral health care and maintaining optimal oral hygiene, as patients with facial clefts are at a higher risk for caries than the general population. Oral hygiene is a challenge due to altered tooth morphology (such as enamel hypoplasia), crowding and malocclusion that result from the facial clefts and anomalies. Dental development should be followed very closely to ensure optimal oral health and the eruption of both the primary and secondary dentitions. A variety of disciplines are required to care for this population of patients, including specialists in plastic and craniofacial surgery, ENT, speech language therapy, pediatric dentistry, orthodontics, oral and maxillofacial surgery, genetics, nursing, family care and psychology. The amount of time required to attend separate appointments for each of these disciplines would be overwhelming for the families. Team clinicians are now making themselves available to see patients on one day during the cleft palate clinic, greatly reducing the demands on the patient’s family. Such commitment by team members— prioritizing the needs and schedules of the patient in a clinic setting—demonstrates a renewed focus on providing effective patientand family-centred care. It is routine for patients with facial clefts and other craniofacial anomalies to require multiple surgeries, dental and orthodontic treatment and speech therapy. Yet there is more to treating these patients than the repair of physical differences. Our face is what others see first, and we’re often judged by our appearance. How does a facial difference affect a 6-year-old boy on his first day of school, or an 11-year-old girl going to her school dance? To help with these social challenges, team care has expanded to include services beyond the surgical repair of the cleft and the straightening of teeth. Craniofacial care teams work in conjunction with support organizations to bring social work, psychology and family care representatives into the team in order to address the psychosocial health of patients and their families. One such support organization is the aptly named AboutFace, a national organization that provides support for patients and their families who are affected by a facial difference. AboutFace offers a variety of support systems, such as networking patient-to-patient or family-to-family talk groups, camps, educational programs for schools, information booklets, CDs and books, including some authored by patients themselves. One of AboutFace’s most successful support initiatives is the Trailblazers camps, adventure retreats designed for young patients with a facial difference between the ages of 10 and 18. These camps provide an opportunity for children to go to camp in a setting where all campers will have something in common—their facial difference. 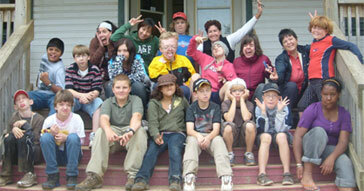 The children usually spend a long weekend together under the guidance of trained counsellors from AboutFace. Campers have a unique opportunity to make new friends with whom they can discuss fears, challenges and best characteristics. The experience helps build self-confidence in the campers through participation in fun outdoor activities like canoeing, climbing, horseback riding and archery. The campers enjoy campfires and talk sessions, where they can share in an open, non-threatening environment with enough unstructured time to allow spontaneous conversations on issues that affect their day-to-day lives. support for young people with facial differences. For the first time last summer, children from the Maritime provinces had the opportunity to attend a Trailblazers camp organized by AboutFace with the help of the IWK Cleft Palate Team in Halifax. Members of our cleft palate team have heard positive comments from children returning from the camp, with many asking, “Can I go to camp again next year?” There are 6 Trailblazers camps offered in various regions across Canada. Dental practitioners in the community can become involved in the care of patients with cleft lip and palate and facial differences by understanding and supporting the needs of this special group of patients. The most effective way to help is through knowledge—serving patients and their families by becoming aware of the basic treatments these patients undergo and inquiring about their wellbeing beyond the surgeries and their oral health regimen. How are things going in school? Do they have friends and do they take part in social activities with their peers? Dentists can also become more knowledgeable about the cleft palate team in their community and support organizations such as AboutFace (www.aboutfaceinternational.org) and the American Cleft Palate–Craniofacial Association (www.acpa-cpf.org). This group of patients may have a special set of needs, but they also have a special set of gifts they will give back to dentists and their staff when they become a part of a dental practice. Dr. Russell is associate professor and division head of orthodontics at Dalhousie University. She is an orthodontist with, and chair of, the IWK Cleft Palate Team at the IWK Health Centre in Halifax, Nova Scotia. Email: Kathy.Russell@Dal.Ca.